Heeft u een vraag voor Queen Grand Boutique Hotel and Spa? 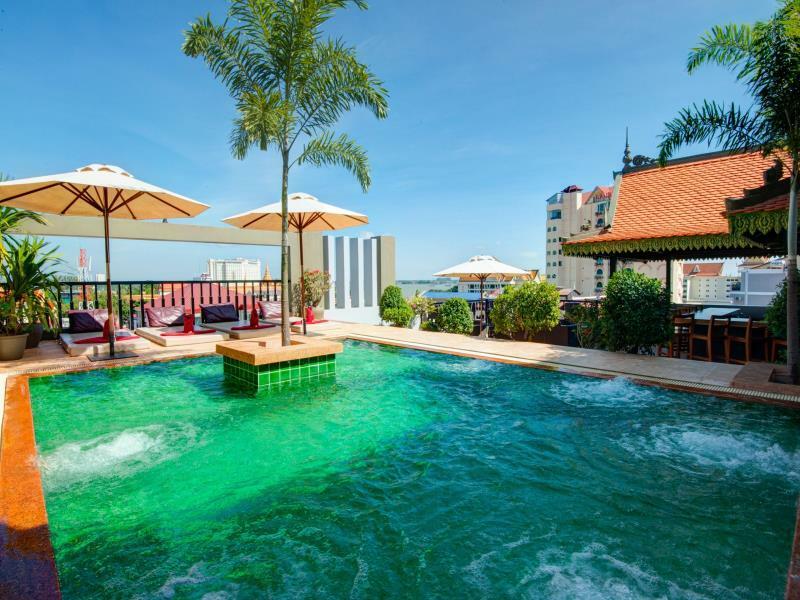 Als u zoekt naar een gunstig gelegen hotel in Phnom Penh, kijk dan niet verder dan het Queen Grand Boutique Hotel and Spa. Op slechts 12 Km afstand, kan dit 4-sterren hotel eenvoudig worden bereikt vanaf het vliegveld. Een plezierige omgeving en de nabijheid van Cambodia - Vietnam Vriendschap Standbeeld, Samdech Hun Sen Tuin, Pencil Markt verschaffen dit hotel een bijzondere charme. 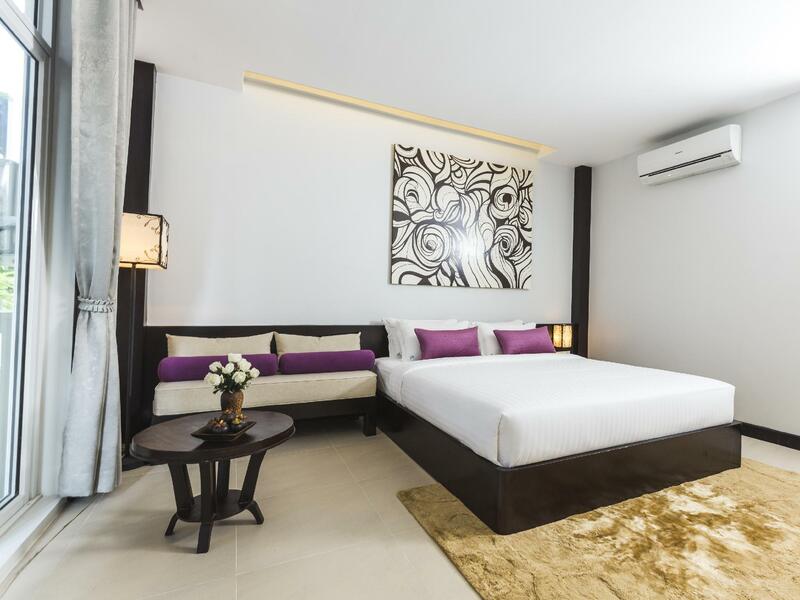 Het Queen Grand Boutique Hotel and Spa biedt tevens vele faciliteiten om uw verblijf in Phnom Penh zo aangenaam mogelijk te maken. De topfaciliteiten van het hotel omvatten gratis wi-fi in alle kamers, 24-uur beveiliging, dagelijkse schoonmaak, taxi service, ticket service. Aanvullend beschikken alle gastenkamers over een variëteit aan voorzieningen als plasma tv, oploskoffie, thee, gratis welkomstdrankje, spiegel, om zelfs de meest veeleisende gast te tevreden te stellen. De recreatieve faciliteiten van het hotel, inclusief zwembad (buiten), wellnessfaciliteiten, massage, zijn ontworpen voor maximale ontspanning en onthaasting. 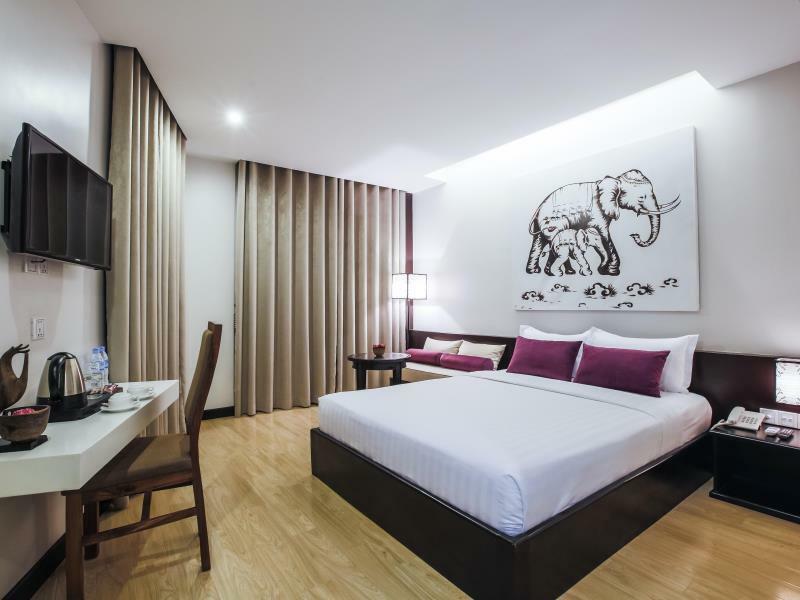 Het Queen Grand Boutique Hotel and Spa is een slimme keuze voor mensen die reizen naar Phnom Penh: een ontspannen verblijf is gegarandeerd. fijn hotel met ruime kamers en een goed onbijt . airportservice is ook prima en niet duur. Mixed up our stay giving us a double when we booked a king room but they changed it the next night. Never offered an upgrade whwih I though would have been appropriate as they said the king rooms were all booked, just a free drink. Friendly staff, if you're happy to walk <10mins there is plenty near by. We have stayed there 3 times over several years. Little side street makes it quieter but there is new construction directly across the road that has just started. I love staying here. It has a Cambodian/colonial feel located in the side streets but close to the Palace and wide parks where many Cambodians gather in the evenings to share the space and the cooler night air. Plenty of eating places and short distance to the Naga World casino if that's your thing. I felt very safe and comfortable walking the streets at night although the footpaths are a little small and crowded by vendors food carts. Its part of the atmosphere. The breakfasts are great, asian and european choices and planty to satisfy. The rooftop Sky Bar is good for an evening drink and meal with a view over the sparkling city lights. Second time at the Queen Grand and had a very comfortable stay. For some reason I was "upgraded" after my first night stay to a room that was identical but on a lower floor. Slight inconvenience but not too much hassle. The rooms are good size and facilities terrific. Breakfast is very good with plenty of food and beverage options, nice fresh fruits and good coffee. What a great find in the middle of Phnom Penh City. 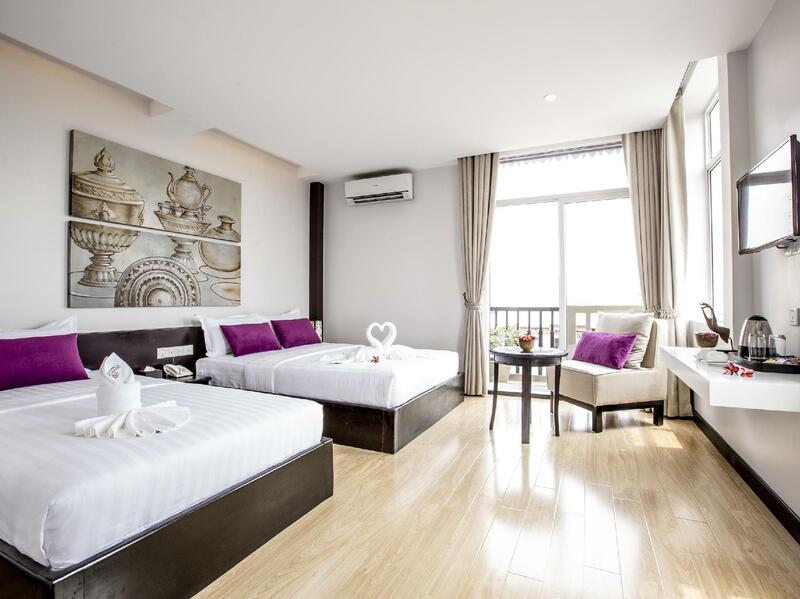 This boutique hotel with large, modern, clean rooms is fantastic value. The staff are just wonderful, so courteous and helpful and English is spoken well here so you won't have any issues with getting help for anything you need. The breakfast is a large buffet with Western ad Asian cold and hot selections. 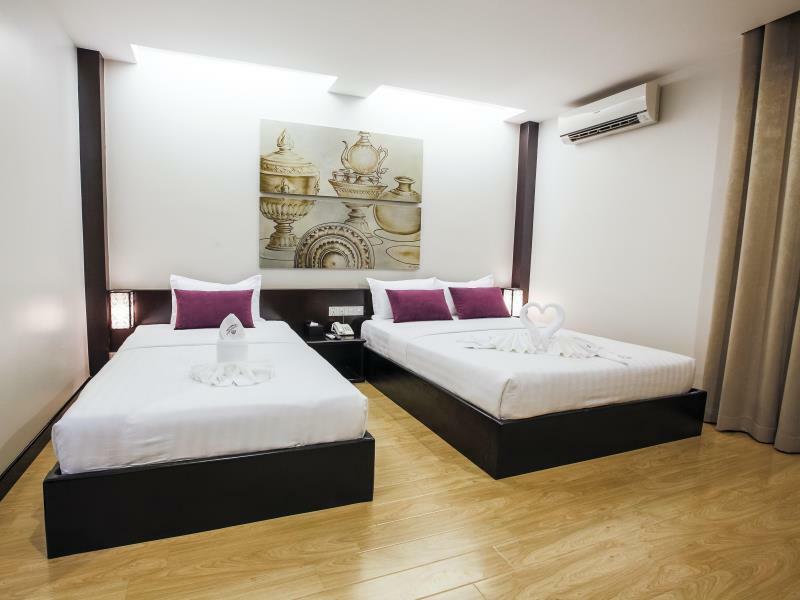 I am thrilled to know about the Queen Grand Boutique Hotel for future business trips to Cambodia. A great base to work from and close to a lot of riverside restaurants and the Naga World casino if that's your thing. There is nothing to say bad about this place. However, slightest problem is that you can tell the housekeeper is abit lazy and don't clean up the bins or floors in the toilet. Despite that, all very good, spacious rooms, staffs at reception and restaurant very helpful. Food takes a bit long time (30-40mins) to finish. The staff at the Queen Grand Hotel made our stay very welcoming, comfortable and fun! We greatly enjoyed our time there during our family vacation and if we ever go back to Cambodia we definitely stay here again! The hotel manager (Roberto) and staff are very helpful and will guide you throughout your stay. They will actually help you plan your trips to Angkor Wat or other areas. The food is very good, breakfast is amazing, very clean rooms with views. Hotel/resort is is in excellent condition with a large pool and tropical-relaxing surroundings. Great value for your money. Overall experience was awesome. I would recommend this hotel to all my friends and family. Its my 2nd home when in Cambodia. We booked two rooms at this hotel for a short visit . The hotel is clean and well kept and all staff were extremely friendly and welcoming. Breakfast was excellent with a large assortment of food. Overall it was good value and nice hotel. The bad - The hotel wanted to squeeze a charge from us for a child breakfast even though the booking specifically said “free breakfast” after all travellers declared in Agoda tool. Hotels can limit quality of free breakfasts in the tool and this is what they should have done. Although not a significant charge I refused to pay on principal and the manager eventually capitulated while still trying to rationalize the charge. I should have had to have the argument in the first place for the caliber of this hotel. Anyway the end result was that it was a nice stay and I would recommend the hotel. Location is ok, near to Naga world. Outside hotel can get tuk tuk easily. Hotel facility is good, you can massage and have spa in the hotel. There is a rooftop bar too. Beer is cheap 👍🏼 the breakfast is good too. Room is all right, very comfortable and comes with a tiny balcony. Ours overlook the building next door but there’s not much to expect from Phnom Penh being so congested. There’s a spa on the top floor and plenty options on the road that the hotel is on. No disappointments! Everything was ready for us on arrival and as expected, took complete control of our luggage too. Unlike many hotels that can take 20+ minutes to deliver luggage, here they did so within just a few minutes. Breakfast was adequate although I found the coffee only lukewarm. Breakfast contains food that is attractive to locals but they do offer cereals, toast, croissants and jam too. Good service here. Of course, they offer eggs cooked in many ways as well. The room was nice and roomy. Clean and tidy and the bed was comfortable. The balcony was small but I did sit out there for a while and enjoyed the experience! Leave the hotel, turn left and within 100 metres there is a park/independence square. We arrived on new year's eve and found this park full of people, stalls, live music ... I imagine they celebrate other events there too so watch out for that. Overall, I do recommend this hotel! Our 2nd visit and we love this small hotel. Very nice bed and comforter. Breakfast is very good. Location is close enough to the riverside. We got a good massage in the spa as well. We will rebook same place and room next time ! 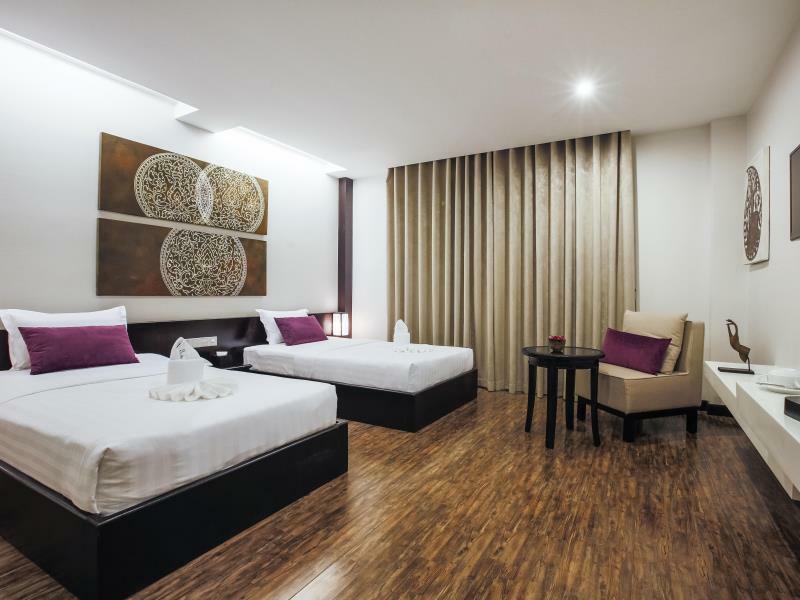 What a fantastic hotel - an oasis of calm and tranquillity, that I can highly recommend for your next visit to Phnom Penh, Cambodia. 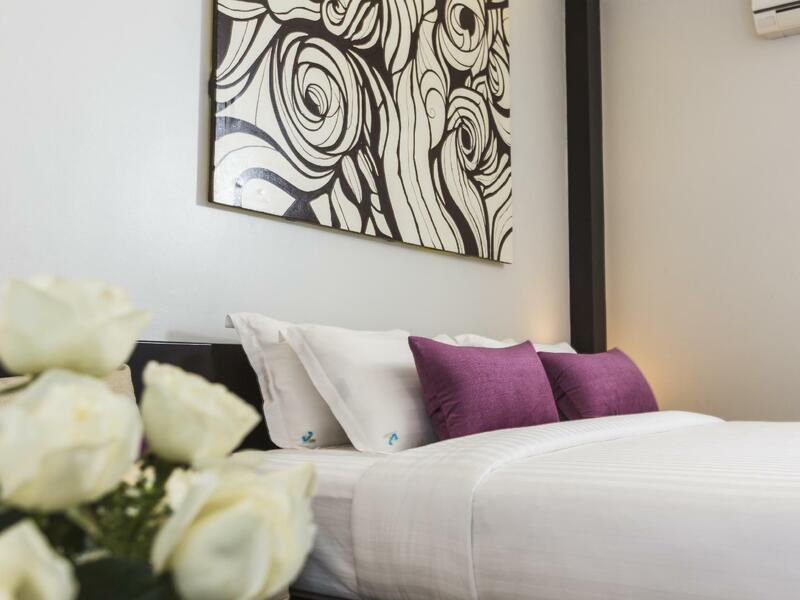 Close to the river and royal palace and featuring spacious rooms as well as a roof top bar and pool from which to admire spectacular sunsets. I only stayed here for one night but I wish it was more. My room was big, comfortable bed and good aircon, I had a balcony overlooking the palace. The hotel is very clean and the staff are so helpful and friendly. Breakfast was nice with lots of options. I loved my stay and will definitely be going back.